DUMBARTON and Cowdenbeath shared the spoils in a SPFL Championship clash at the Bet Butler Stadium in front of 700 fans. 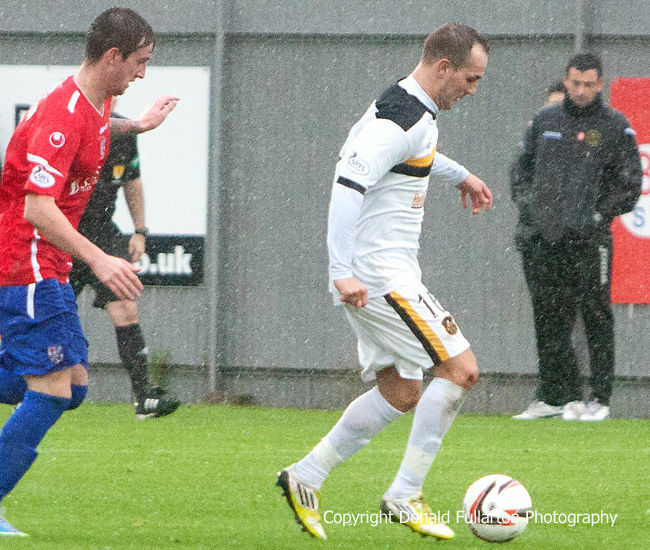 DUMBARTON and Cowdenbeath shared the spoils in a rain-soaked SPFL Championship clash at the Bet Butler Stadium in front of 700 fans. With manager Ian Murray serving the third of this three games suspension and watching from the stand, assistant manager Jack Ross's men had the better of the drier first half, with Bryan Prunty and Mitch Megginson strikes coming close and a Jordan Kirkpatrick volley hitting the bar. After the break the rain turned into a downpour and Colin Cameron's Blue Brazil looked the more likely team to take the points, with on loan Rangers striker Kane Hemmings missing two good opportunities. At the other end Aaron Barry headed straight at the keeper with the goal at his mercy, and Megginson hit the post with a rasping drive. At the end a draw was probably fair, and the two teams return to the Bet Butler next Saturday for a William Hill Scottish Cup third round tie. The picture shows Jack Ross watching Scott Linton on the ball against his old club.